The government and ruling establishment's Operation fear appears to be having the exact opposite effect as bogus reports on a daily basis that paint a picture for a BrExit doom resulting in REMAIN pulling ahead of LEAVE, instead it is the heavily financially disadvantaged LEAVE that has now nudged into a LEAD over REMAIN as an analysis of recent opinion polls illustrate. Ignoring all polls that gave either side more than 10 point lead such as yesterday's that gave LEAVE a 19 point poll lead and also last Friday's by ORB that gave LEAVE a 10 point lead as being propaganda polls constructed purely to grab the headlines. Then as the below table illustrates that LEAVE on an average basis has now nudged marginally ahead of REMAIN for the first time this year. In comparison an average of the 10 polls a month ago (again ignoring those that gave more than 10% lead) put REMAIN in the lead on 51% against 49% for LEAVE. Therefore with momentum clearly on LEAVE's side then this suggests that LEAVE's poll standing should continue to improve into voting day and thus implies the average of the polls by the 23rd of June will be LEAVE 52% against REMAIN on 48%. The average of the last 6 polls has REMAIN in the lead on 51% against LEAVE on 49% (11th June). However the REMAIN lead is set against the big picture of momentum being on the side of LEAVE that appears to be ACCELERATING. For instance 3 weeks ago REMAIN were ahead on 54% to 46%, which was typical of the REMAINs lead since the start of 2016 that entered the new year on 56% against 44%. However, if as I expect that the LEAVE campaign momentum can be maintained for the remaining 11 days then LEAVE should be able to just achieve a tight referendum victory. Therefore the sum of my year long analysis comprising well over 120 articles and over a dozen videos then my forecast conclusion is for a LEAVE victory of 51.3% to 48.7%, a winning margin of less than 2.7%. But to achieve this victory all Brexiters need to further intensify their efforts because as things stand today (12th June) REMAIN is probably just marginally ahead with less than 1% between REMAIN and LEAVE on an estimated 50.4% REMAIN against 49.6% LEAVE, so there is still a lot of hard work to be done in these last few days do achieve a LEAVE Brexit outcome. Whilst the opinion polls are resolving to give LEAVE a small lead, the bookies such as Betfair have been consistently been strongly favouring REMAIN, for instance Betfair is giving odds of 3.30 for LEAVE and against 1.40 for REMAIN. Clearly either the polls are wrong or the bookie odds are wrong. In this respect as my own analysis is leaning towards the polls as being closer to the more probable than the bookies odds continue to present an opportunity for punters. As I have been tracking the betfair EU Referendum prices for about a year now, during which time I have seen the LEAVE odds go from a high of 6 to the current low of 3.30 and falling fast! I personally started accumulating a position in LEAVE from 4.5 with my last addition at to 3.6, so the current odds are not that much worse then they were a month ago! Therefore are still offering a pretty good risk / reward opportunity especially when one considers that LEAVE has just taken a poll lead with momentum on LEAVEs side! You too can help achieve a LEAVE victory by supporting our BrExit campaign in this last push to secure Britain's future free of the emerging EU superstate. 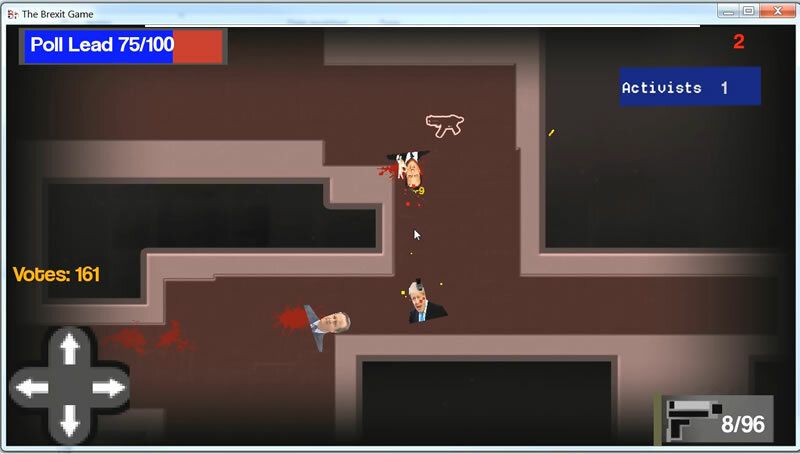 We have also recently released a fun to play FREE 'The BrExit Game', a first person shooter featuring BrExit hero Boris Johnson doing battle against a horde of David Cameron zombies, battling for votes by defeating the propaganda zombies and accruing activists so as to buy votes gaining fire power and to unlock and explore more areas of the electoral map. See how many votes you can win by battling against David Cameron's zombie propaganda establishment hordes! The game is really easy to play, just use the arrow keys for movement, and mouse to point and click to fire. Use R to reload and G to interact with items on the map. The game is FREE, written in Java that has been tested to run on desktop PC's and android O/S. We have also created an android O/S version, though not yet available from the Play Store, but can be downloaded from here and copied to your device. The app does NOT request any permissions as it does not access any of the phones functions, i.e contacts, camera, storage, telephone, location etc. 3. Click to install and then play the game by clicking on the installed BrExit game icon). If you have enjoyed the game then consider supporting our BrExit campaign helping to ensure a LEAVE outcome on June 23rd.